The first of three presidential debates between Sen. John McCain and Sen. Barack Obama took place at the University of Mississippi in Oxford, MS, on Sept. 26, 2008. The topic of the debate was slated to be foreign policy, but the financial meltdown that occured in the weeks leading to the debate meant the economy became a major topic anyway. Those financial crises included the federal takeover of Fannie Mae & Freddie Mac, the quasi-governmental mortgage-makers; and two private companies, AIG and Washington Mutual. Sen. McCain reacted to these crises by suspending his campaign to return to Washington, and asked to postpone this debate. Sen. Obama responded by claiming that the president needs to be able to "multi-task." The debate went on as scheduled, after a high-profile meeting between McCain, Obama, Pres. Bush, and several cabinet officials and members of Congress. Pres. Bush's proposed bill, which would let the Treasury decide how to spend $700 billion on bailouts and relief, was rejected by Congress on the same day of this debate. The high-profile meeting did not produce a new resolution to the crisis. The debate was sponsored by the Commission on Presidential Debates, a bipartisan organization. The moderator was Jim Lehrer, anchor of the PBS "NewsHour" program. The debate was watched by 52 million people (not a record, since it was a Friday evening). McCain won points in the post-debate because Henry Kissinger disagreed with Obama's assertion that Kissinger concurred about talking to Iran. (In fact, Kissinger did agree with Obama that TALKS were appropriate and the Cabinet level was the right level; but McCain has succeeded in portraying Obama as seeking PRESIDENTIAL-level talks, even though Obama claims he meant CABINET-level talks. Obama should have anticipated Kissinger's denial since Kissinger is a McCain adviser). McCain stated clearly that he believed the surge had succeeded, and dared Obama to state that it had failed. Obama declined the dare, getting into a back-and-forth on "tactics" vs. "strategy." Obama has been clear that he believes the surge has failed in its objective of creating space for POLITICAL success. Hence McCain won the point by framing the surge issue as a MILITARY success. However, "winning" the debate is irrelevant -- it's just one battle in the larger war of the election. In this debate, Obama clearly won the larger-scale victory towards election, because he succeeded at appearing as McCain's equal in presidential stature and in foreign policy knowledge. Millions of undecided voters saw Obama as looking adequately prepared for the presidency -- a key issue on which many voters were waiting to see how Obama performed. He passed muster on this issue. Neither candidate turned the other's supporters to their side -- which is what the pundits mean byt heir analysis of who "won" -- but we suspect that many previously undecided voters turned to Obama at this debate. That's what "winning" REALLY means -- how people will vote on November 4th -- and Obama clearly "won" the debate in that respect. How can we say that McCain won the debate but Obama won the larger electoral victory? Well, I'll make an analogy to my days as a high school wrestler. High-school wrestling matches are scored by "Team Points" -- if you win your match, you gain one Team Point; if you trounce your opponent, you gain three Team Points; if you pin your opponent, you gain six Team Points. My coach gave me an achievable goal: "Go out there and don't get pinned!" I was a lousy wrestler, but I excelled at NOT getting pinned. So at the end of a typical bout, I would be trounced by my opponent, who would be applauded by his team bench, and then I would return to my team bench to even louder applause. Why? Because I had saved my team three Team Points, in comparsion to getting pinned. My coach formulated a strategy that counted on my ability to not get pinned -- and I came through, every time. Despite losing my matches, I made my team's larger victory possible. McCain needed to pin Obama in this debate. Obama did not get pinned. Hence even though Obama "lost" this debate, he succeeded ni his larger strategy of gaining votes for the election. 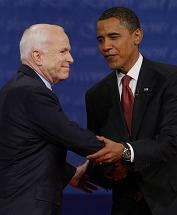 McCain will now need to pin Obama in the next two debates. All Obama needs to do is struggle to a draw, or just lose by a little bit, and he will get elected. Barack Obama: We�re in the worst financial crisis since Great Depression. Barack Obama: The lax regulation that Bush favored got us in this disaster. Barack Obama: Pay attention to Main Street, not just Wall Street. Barack Obama: Decide financial rescue plan on future slower tax revenues. Barack Obama: Spending freeze is like a hatchet where you need a scalpel. John McCain: Have no doubt about the magnitude of financial crisis. John McCain: Recoup financial bailout cost by cutting spending. John McCain: Freeze on everything but Defense, Veterans & entitlements. John McCain: I have fought against excessive spending my entire career. Barack Obama: We need Wall Street responsibility BEFORE financial crises. Barack Obama: High corporate tax rate is offset by numerous loopholes. John McCain: Warned about corporate greed & excess; supports bailout. John McCain: Need stricter interpretation and consolidation of regulators. John McCain: Offshore drilling & nuke power instead of $700B to enemies. Barack Obama: We must be tough with Pakistan & stop coddling Musharraf. Barack Obama: Must be tough on Iran, but talk to them too. Barack Obama: Recent Russian actions in Georgia are unacceptable. Barack Obama: Kissinger agrees with me on meeting with enemy leaders. John McCain: Nuclear Iran is an existential threat to Israel. John McCain: Preconditions required for talks with rogue states. John McCain: Russian aggression in Georgia is wrong; I see KGB in Putin. John McCain: Sit down with any leader, but only with pre-conditions. Barack Obama: Eliminating earmarks isn�t enough; but I�ll check every line. John McCain: Get earmarks under control to deal with the financial crisis. John McCain: Obama requested for $932M of pork projects; I fought pork. Barack Obama: Health tax credit is bad idea; it will cost taxpayers more. Barack Obama: $15B subsidies to private insurers was a lobbyist giveaway. John McCain: $5,000 refundable tax credit for every family. John McCain: Family should make health decisions, not federal government. Barack Obama: Strategic issue is where to send & how to fund our troops. John McCain: Make all defense contracts fixed-cost; costs out of control. John McCain: Experience has taught me: the US military must not fail. Barack Obama: End incentives that move jobs overseas. John McCain: Cut business taxes so companies will keep jobs in US. Barack Obama: Yes, earmarks are abused, but small compared to tax cuts. Barack Obama: No $300 billion on tax cuts for those who don�t need them. John McCain: Worst thing in bad economic climate is to raise taxes. Barack Obama: Google for Government was a bipartisan initiative. Barack Obama: Unwise war in Iraq distracted us from catching Bin Laden. Barack Obama: The surge is a tactic to contain 4 years of mismanaged war. Barack Obama: Afghanistan needs more troops and resources. John McCain: We now have a great strategy & are winning in Iraq. John McCain: The next president has to decide how and when to leave Iraq. John McCain: In Afghanistan, employ same winning strategy as in Iraq. John McCain: Don�t threaten Pakistan; it�s part of Afghan strategy. The above quotations are from 2008 first presidential debate, Barack Obama vs. John McCain, at the University of Mississippi.